Caitlin has so many kids, she literally does not own a photo of herself without a child in it. Mom of 4 (by birth and adoption), Caitlin spends her days picking up Cheerios and wiping butts while wondering why she ever got a master’s degree. 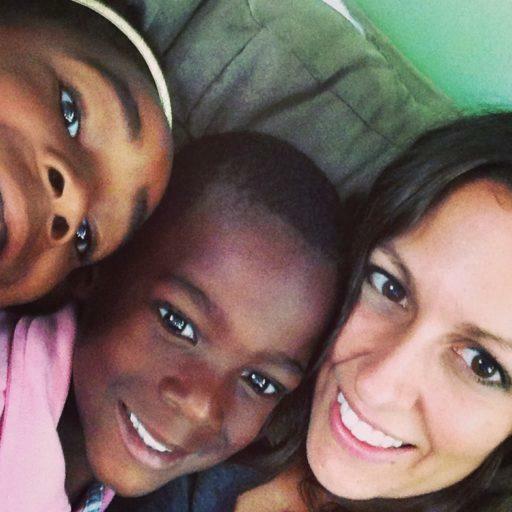 When she’s not looking for lost shoes or yelling at her kids to stop yelling, Caitlin seeks out opportunities to connect with other “real” moms and find ways to make our busy lives easier. If you shower and put on makeup every day, shop at stores that don’t just sell kids clothes, serve your kids organic-while-adorable bento box lunch creations every day and have a living room straight out of a Pottery Barn catalog with nary a toy in sight…. then you should probably be the one blogging, because you’ve got this stuff all figured out! But if you’re like me and sometimes realize you haven’t looked in a mirror in days and your kids’ lunchboxes could win awards for their unoriginality, then this might be the blog for you. Whether you are looking for toys your kids will actually play with, tips for traveling with kids, or just want to laugh at whatever I’m currently laughing at, you can find it here at Real Mom Recs. Interested in collaborating? Work with me! Tiana, age 8, dreams about going to parties without her parents there so she can wear high heels and eat all the desserts she wants. She wants to be a hairdresser when grows up and (much to Caitlin’s horror) loves dresses, makeup, hair, and all things girly. Tiana’s strengths are dance, gymnastics, watching out for her younger siblings, and never letting her mom get the last word. Zari, age 7, uses his charm and killer smile to weasel his way out of trouble. As mischievous as he is soft-hearted, Zari always keeps us expecting the unexpected. Zari’s favorite pastimes include eating anything that’s frozen, turning household objects into Ninja Turtle weapons, building with Legos, and beating his friends at monkey bar races. Elle “dimples for days” Carmelina is our fun and sassy 4 year old. What she lacks in size, she makes up for in tenacity and pure strong will. When her fiery temper awakens it is enough to send her older siblings running the other way. A self-described “puzzle master”, Elle also enjoys reading books, playing dress up, and engaging in any kind of pretend play (as long as she’s the director). After her recent promotion to big sister, Elle alternates between doting on her baby brother and asking her mother to put him back in her belly. Our latest addition, Luca, is your typical baby who enjoys doing typical baby things. Right now his days consist of eating, playing, and making sure his Mommy never gets a full night’s sleep. Your family is lovely. I love your descriptions. What a great about page – ‘dimples for days!’ Love Zari’s smile – I bet he can charm his way out of a lot. Beautiful family. Thanks Karen! They are a handful but certainly a lot of fun too. Caitlin, I love your descriptions of your kids! I bet they do too!